At the front entrance lanai of Henrietta and David Whitcomb's home on Diamond Head. The house David Whitcomb set his heart on doesn't have much space for a garden, but it has the ocean off Diamond Head as its back yard. And -- perhaps more important than the home's proximity to the azure Pacific Ocean -- it has a home theater big enough to seat 12 and a monster-sized garage perfect for his hulking 1969 Mercedes Benz convertible that he affectionately refers to as "The Beast." It's a guy thing, and the women around him knew he was going down the wrong path. "Basically all the women said no. My wife, my sister and my Doberman pinscher real estate agent (who's unfailing in protecting her clients' interests) all vetoed it," Whitcomb said. Aside from the lack of garden space, the house has a floor plan resembling the inside of a nautilus shell, his wife, Henrietta, recalled. "It was too confusing; it had all these rooms. To get anywhere, you had to go through everything else first." In retrospect, Whitcomb, who's still fond of the house, realizes the women were right. Nearly two years later, that house is still on the market waiting for a buyer, and the Whitcombs are settled happily in a nearby house surrounded by lush tropical landscaping. 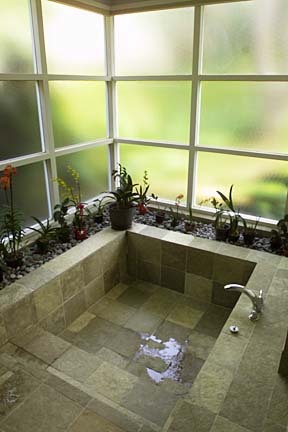 The home has a furo. Although it's not oceanfront property, the Whitcombs' domicile is a typical kamaaina-style home designed for open space, indoor-outdoor living and casual comfort. The ocean is a few blocks away, and the rolling surf set against a row of stately coconut palms is the view from Whitcomb's second-floor home office, which he refers to as "The Penthouse." "I don't have the ocean right at the door, but this is pretty nice, too," said Whitcomb, who added a lanai to his office to better enjoy the ocean view. The women convinced him this property was the right choice although at the time it didn't look its best. The house was in decent condition, but landscaping was nonexistent. "It looked like the base of Diamond Head. It was like a desert; everything was dead," said Dana Anne Yee, the Whitcombs' landscape architect. Describing them as dream clients, Yee said the Whitcombs' only instructions were that they wanted to save the property's original trees: a small grove of olive trees and cedars in the back, and a grouping of Singapore plumerias in the front. 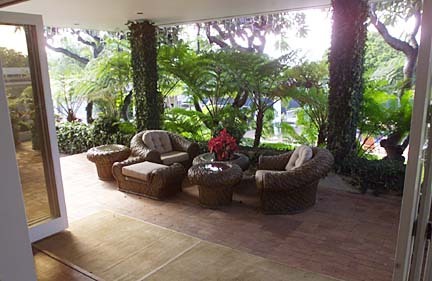 The trees were given careful and repeated trimmings and nursed back to health, green grass was planted and curvilinear planting strips were added along the edge of the house for blooming gingers and impatiens, native ferns, mondo grass, fern trees and other decorative plants. 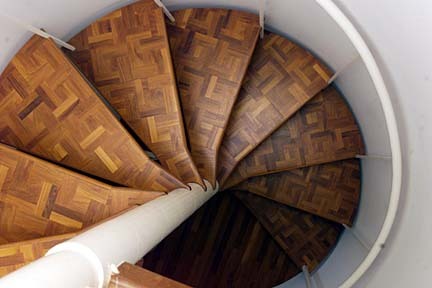 Detail shots of the Whitcomb home include a parquet floor spiral staircase. The one-acre property provided ample space for rolling lawns and flowering plants, plus new fruit trees to complement the lone mango tree. The outdoor space is ideal for large gatherings, and the blooming plants provide the woman of the house a steady supply of cut flowers for the home. The back yard, with Diamond Head as a backdrop, recently was the stage for the wedding reception of television news anchor Diana Ako, a relative of Henrietta Whitcomb. 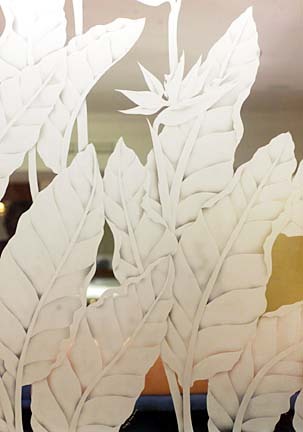 Etched glass inside the home. House guests tend to congregate outside -- the children particularly are fond of the pool and the sprawling back yard lawn. Mainland guests always are taken by the tropical landscaping, admiring the plumeria trees dotted with flowering orchids, the Whitcombs said. "We realized, when we saw the property, it had potential. It has good bones," Henrietta Whitcomb said. "It's the kind of old-fashioned Hawaiian house, and that's what we wanted." The property also comes with a pedigree. It is on the most desirable street in Oahu's most exclusive neighborhood. It was designed by respected architect Vladimir Ossipoff, and later remodeled by another noted architect, John Hara, before the Whitcombs purchased it. 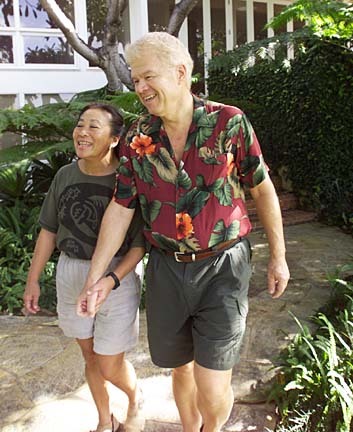 Dave and Henrietta Whitcomb stroll the one-acre grounds of their home. Landscaping includes a lush lawn and flowering plants, plus new fruit trees. The house with two hand-crafted metal gates -- one with a Diamond Head motif and another with bird of paradise designs -- has a tennis court, a swimming pool, an outdoor living area featuring a large lanai and fully-equipped kitchen. The indoor living space, covered with marble and teak flooring, measures 8,000 square feet. There are three living areas (including a sunken family room for watching television), a master bedroom with Japanese-style bath and shower, well-separated guest quarters, plus a Jacuzzi and sauna, among other features. 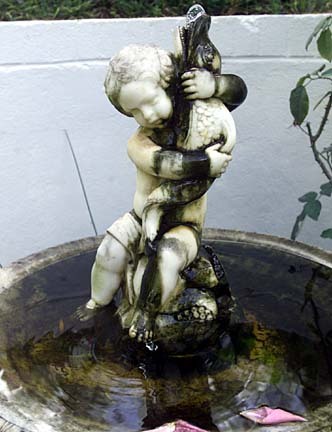 A fountain in the garden. "I really liked the house, but I panicked after we bought it," Henrietta said, recalling the monumental job of selecting furniture for the giant home. "We went from a one-bedroom apartment in New York to this big house. I had no idea how I was going to do it." They hired architect Paul Noborikawa, who arranged for local artisans to handcraft koa furniture, colorful and curvy seating sofas, a glass panel etched with bird of paradise designs and other artistic touches for the home. Henrietta Whitcomb wanted local crafts as well as artwork by family members to decorate the stately residence. She is related to noted Honolulu painter Hon-Chew Hee, who was married to her mother's sister. Hee's paintings as well as watercolors by her mother, aunt and grandmother are scattered throughout the home. 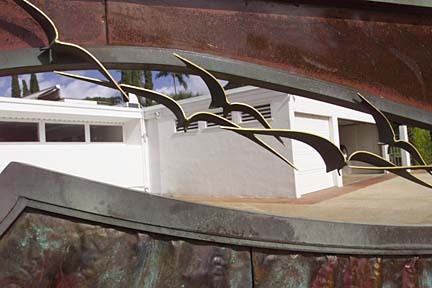 The rear exterior features a metal sculpture in the foreground. After renovating and refurbishing, the house and garden are pretty much customized, though David Whitcomb still has his heart set on having an "extreme garage" to satisfy his wish for collectible automobiles. Plus he's thinking of tearing up of the tennis court -- "we never play tennis" -- to make room for a grass court for croquet and a waterfall. While his wishes are grand, her plan is modest: get started on the herb garden by first trimming back the overgrown Thai basil plant. The Whitcombs are both retired New York city professors, but she was born and raised in Honolulu, and they still have their Manhattan apartment (which is about 1,100 square feet) and live there most of the time. They stay in their Diamond Head home for the winter and a shorter summer vacation. 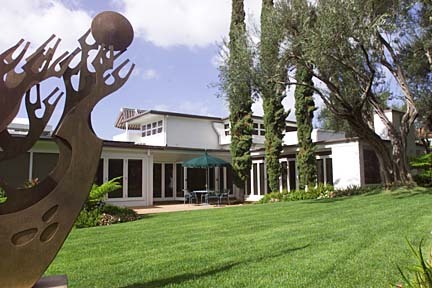 The landscaping is maintained by Green Thumb Inc., and even when the Whitcombs are not in town, fresh flower arrangements are brought in weekly to the delight of family and friends allowed the run of the property. They are also offered the use of "The Beast" but seldom take the offer. Suzanne Tswei's gardening column runs Saturdays in Today.